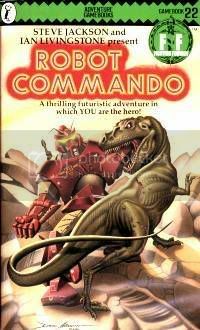 When I picked up Robot Commando, I got ridiculously excited - just look at that cover! It's a dinosaur biting what looks like a Transformer, and the title combines the best of what I loved as an '80s kid - robots and Commando. Oh, and I was obsessed with dinosaurs. Completely bonkers. Basically, your planet has been invaded by an alien race, and they've put everyone to sleep - except you, somehow. It's your job to defeat the invading army, singlehandedly, whilst avoiding being killed by the dinosaurs that roam the planet you call home. So, I rolled 11/18/9, grabbed a standard 'cowboy' model robot and beelined for the City of Knowledge - figuring I'd need to know what I'd need before hitting up the City of Industry. On the way to the CoK, I killed a pteranodon, and soon came across a digger, apparently a potential replacement for my current robot. Well, we have diggers on Earth, and they're nowhere near as exciting as wearable cowboy robots. Once at the CoK, I went to the interestingly named 'War College'. We don't have those on Earth, at least not in this part of the world, and it sounded useful. We're at war, and I'm wearing a giant robot, remember. I was soon attacked by a Karossean (the bad guys), whom I defeated... I went to check out his remains, when he self-destructed and destroyed my robot... which without, I was quickly dispatched by the other Karosseans. Hmmm. I counted this within the 'restart' boundary, and err, restarted. With the same rolls, as I was pretty happy with those. So, I quickly made it back to the same spot, killed him, and continued onto the War College. The Karosseans were closing in, and I only had time to read one book - I chose the one called 'Emergency Procedures', considering I was in an emergency, and it was useless. Damn. I escaped, jumping into one of their robots - the Starscream model, I suppose - and escaped. I went to the Medical College, and made a potion - the antidote to the sleeping virus! I could only make one litre, and it was so volatile it could only be used once. Hmmm. Somehow knowing this jar would still be usefel, I took it with me. There were weird noises, so I bolted. Next up was the museum, and I went to the Karossean cultural display, to learn about these assholes. I found a dead one, stole his uniform - I assume we fit their clothes? - and soon realised they'd been messing about with the T-Rex exhibit. Hmmm.. must be time to bail this place too! Onto the dinosaur preserve. I didn't find anything in the admin department (Yeah, I found a freakin' dinosaur preserve, and the first thing I did was check out the freakin' admin dept), but in the barn was a super cowboy robot. If there's one thing better than a cowboy robot or a wearable Starscream, it's something prefixed 'super'. The dino reserve itself contained vicious Triceratops, plural (however you do it), so I left there. One thing the super cowboy robot couldn't do was fly, damnit. It was one of those times I felt like something was just out of reach due to an idiot ('wow, it has 'super' in the name') decision earlier on. Next up I travelled to the City of Industry, and it was significantly more boring than the City of Knowledge, much to my surprise. I got my robot touched up a but, got hit on the head by a falling book, and found an ape who did my robot some further fixing. Okay, no rocket add-ons or super heavy-duty robots? Anyway, onto the City of Pleasure, something to alleive the dull monotony of industry. Once there, being the geek I am I went straight to the arcade, and a game called Wasp Fighter, which proved that playing games is good for you - my skill against robots increased by one. Bouyed, I played Dinosaur Hunter next, which was fun, then 'Zap the Karossean'. This one was broken, and zapped me back. Onto the City of Jungles, where I found a serpent robot. If this entry's getting a little dull, it's because around here the book did for me too. It started so damn well, and I'm not sure exactly what wrong. I think a little freedom is great in FF books, but perhaps this one went a little too far - I was eventually killed in the Capitol City, after being asked for the return call by some Karosseans, and failing. It was a pretty dull end to an adventure that opened so excitingly, but got far too open and wide far too quickly, without a focus or clue as to just how defeating the invaders would be achieved. I think this book has the real potential to be a classic, for someone willing to buckle down and nut it out - but for a casual stroll, it's too open. It's obvious there's a huge amount to do, places to go, choices to make and paths to follow - and for this, Steve Jackson #2 has to be applauded. So if you're just in the mood to have a romp through a land full of robot-wearing commandos and loose dinosaurs (to be honest, who is never in the mood for that?! ), Robot Commando is perfect. If you're in the mood for a deep, open and mysterious FF adventure, ditto. But if focus and a linear plot is what you're after, or perhaps a quick read, go elsewhere. Perhaps tonight, I was just in the mood for something quicker! Any way you look at it, I'm on a bad run at the moment... and I won't be passing Masks of Mayhem, #23, as it's the first gap in my collection, and hasn't been republished in the current series. I picked up Legend of Zagor the other day from Borders, though I'm several months from visiting that one at the moment. So: all in all, Robot Commando is good if you have the time and patience to give it a decent shot; and a robot made of whatever the Terminator is. This is actually my favorite gamebook. If i remember correctly, the book has about three different "win" endings and even a secret military base with elite robots. I really enjoyed the sandbox approach, although some locations were indeed weaker (eg. the dinosaur preserve). I loved this gamebook back in the day. I mean - cool robots?? Fighting dinosaurs?? Sign me up!! (2) Fight the other side's leader in single ceremonial sword combat. (3) Fight the other side's lead in a massive robot duel! NUmber (1) was dead easy, while the other two were much harder. Just found this wonderful blog via the TV Tropes page (http://tvtropes.org/pmwiki/pmwiki.php/Literature/FightingFantasy) on Fighting Fantasy, and naturally made a beeline — to borrow a phrase from your review — for what was always for me, like Ergotoxin above, my favourite gamebook of all. Despite your somewhat disparaging review, Demons of the Deep comes runner-up; Steve Jackson II obviously hit on a winning formula with me. Starship Traveller would probably also be on the podium, but Robot Commando was always way out in front — as a fellow '80s child with an unalloyed love for dinosaurs and Transformers, it was always a matter of "what's not to like"? As one of my friends still owns all the books (I used to get them out of the local library back in the day), I borrowed this one a year or two back and played right through it. It's amazing how clearly some of the illustrations had remained branded on my memory, particularly the tyrannosaur (naturally!) in a rocky canyon and the awe-inspiring Supertank the big bad rolls out in in Aussiesmurf's option 3 finish listed above, whilst your own mention of the "ape" immediately enables me to picture the sort of King Kong concerned in his quarry/scrapyard/repair shop. I'd forgotten just how eerie the opening of the story is (it's me who added the Day of the Triffids comparison to the TV Tropes page some time back), but it clearly helped foster my ongoing love of postapocalyptic scenarios in fiction, that 'last man on earth' vibe. Similarly, wandering the deserted museum and college buildings in the City of Knowledge has remained lodged in my subconscious, so that I deliberately aped it (so to speak) years later the only time I tried running a series of my own roleplay sessions with friends. I'd agree that the Dinosaur Preserve is a little disappointing (although I love that your tagging it gave you excuse to link consecutively to Starscream and Jurassic Park! ), but then I suppose all the most dramatic dinosaurs are out wandering freely all over the rest of the world. I had little recollection of the other cities, and on rereading they don't seem to measure up to the, erm, CoK, though this meant I could treat it as all-new adventures and was amused to find myself honing my aerobatic skills on that arcade game in the City of Pleasure. I too recall falling foul of the air-to-air missiles or whatever it was over the Capital City on one failed attempt, but the piloting of the airborne mecha was yet another way this book seemed to have a simply enormous sense of scale and remit to wander that was almost unique among the ones I read in the series. Having the multiple 'win scenarios' is great too, although as Aussiesmurf says option 1 is almost laughably easy in its sudden and rather anticlimactic "oh, you've done it" way, and doable purely by creeping around the abandoned backwaters of civilisation without ever coming near the main Karossean forces, so perfect for the rather wussy type like me; you feel like a proper one-man resistance, and I think the payoff might even be something like "No-one will ever know the enormous service you have just rendered, but you have saved your people and your nation". I don't remember option 2 at all, but going head to head with Minos and his Supertank was always cool. There's a nice little article from last year I've just found about the FF series from the BBC websites 'Magazine' section: http://www.bbc.co.uk/news/magazine-28865399, and it looks like someone else out there has been blogging his own playthroughs of the whole series more recently (http://fightyourfantasy.blogspot.co.uk/2013/04/robot-commando.html) and has now moved onto the almost equally marvellous Lone Wolf books too. I'll look forward to browsing through both that blog and yours in the time to come! Thanks a lot for all the excellent writing here.